Cfast (Cosmetically Focused Adult Straight Teeth) braces is a fixed cosmetic orthodontic treatment which is fast,minimally invasive, gentle and simple procedure that corrects alignment issues with the upper and lower front six teeth, and can level and round out the arches, thus satisfying the needs of the vast majority of adult patients who seek correction of misaligned teeth. Cfast uses clear orthodontic brackets and tooth-coloured nickel-titanium wires. The treatment works much like that using clear aligners, but tooth movement is much more predictable and usually two times faster. This allows teeth movement within months and not years. The nickel-titanium wires put gentle pressure on the brackets to level and align the teeth with minimal discomfort to the patient. The gums follow this movement to achieve a fully aesthetic outcome. Traditional orthodontics focuses on the position of the bite, so can take years, Cfast focuses on the front teeth only, so the changes required to correct the smile are not as great and consequently treatment is faster. Once treatment is finished you will need retainers to prevent any unwanted movement in future and as far as retainers have been used correctly teeth will stay in its new position. Fast – The shorter treatment time. 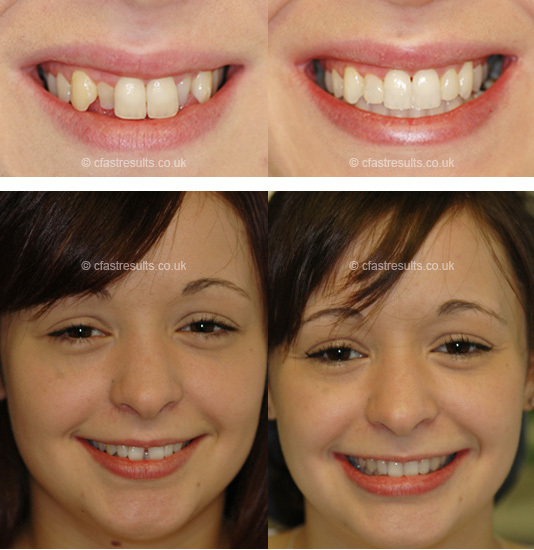 Affordable – No need for multiple veneers!! A beautiful smile which is affordable. Discreet – The clear brackets and tooth-coloured wire which helps with appearance during treatment. There isn’t one. If your case is considered suitable for Cfast, the treatment is safe and clinically appropriate, and because it does not claim to address major orthodontic issues and can be done very quickly, it is much cheaper than other options. Please feel free to book for a consultation.